(Note: if you are unfamiliar with scalers, better read old topics on scalers like this one: http://www.imvu.com/catalog/modules.php ... p=10519256 before they got deleted. Plus, more generalised info about how Scalers and Debug panel editing work: viewtopic.php?f=17&t=262). First use I came with is "repositioning" accessoires or bones without visually scaling them. Since scaler affects relative offset between its bone and the next bone in hierarchy, we can then write the second scaler for this next bone, which will neutralise scaling, but keep the changes in offset. As you can see, it has a bone inserted between root (Female03MasterRoot since originally it was an avatar) and the rest of the bones, called RotationExtra. RotationExtra was moved to the right creating an offset. In order to create scalers for accessoires you'll have to know their bone names. You can contact the original creator of the accessory, or try to guess the names yourself if the first option isnt available. 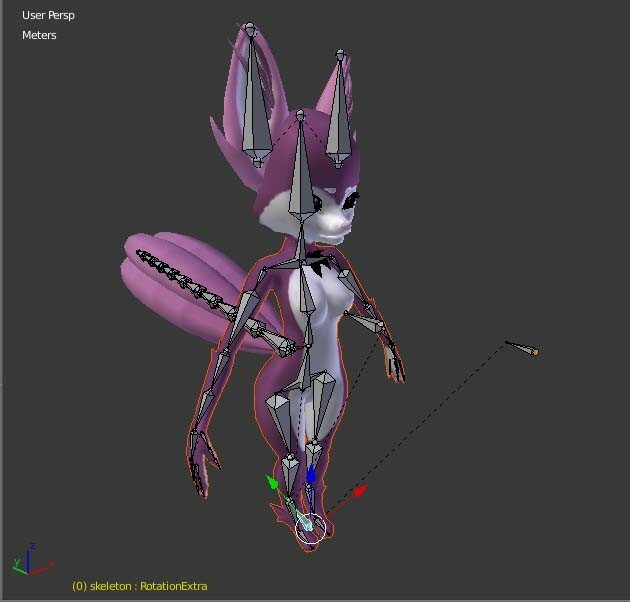 Some tips on the possible naming: accessoires made in 3ds Max usually contain "AttachmentRoot" bone as the root of their hierarchy, and the next bone called "AttachmentNode" (though AttachmentNode may not have anything meaningful connected to it. The default bone name in 3ds max is "Bone", and the naming convention for te new bones will be "Bone01","Bone02" and following. Provided the creator is lazy, they may not rename them at all. In Blender, there is no AttachmentRoot (usually), the default bone name is the same as in Max, and additional bone numbering will start from "Bone.001" (take note of the dot and two zeroes). Setting materials to 2-sided fixes that.